Mr. Xi, the most powerful Chinese leader since Mao, rarely mingles with the public. 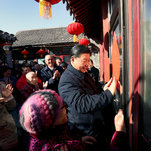 But ahead of the Year of the Pig, he made an exception, visiting a historic Beijing alleyway on Friday to hang decorations with residents and make dumplings, a favorite New Year food. On Saturday, he joined soldiers as they raised a flag in the Forbidden City. He inspected their dormitories, asking whether they were warm enough with only one layer of sheets.